“Pin-up series”. 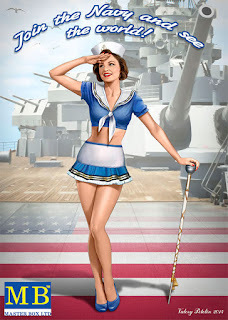 These kits are a part of new a series in 1/24 scale which is new for Master Box. 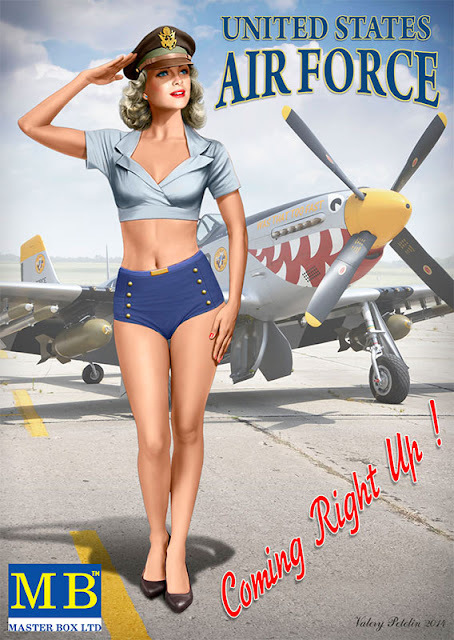 The choice of scale for this Pin-up style series is because there is an enormous number of model kits in 1/24th scale on the market, whilst there is a deficiency of figures in this scale. The series is offered with the aim of making up this deficiency. 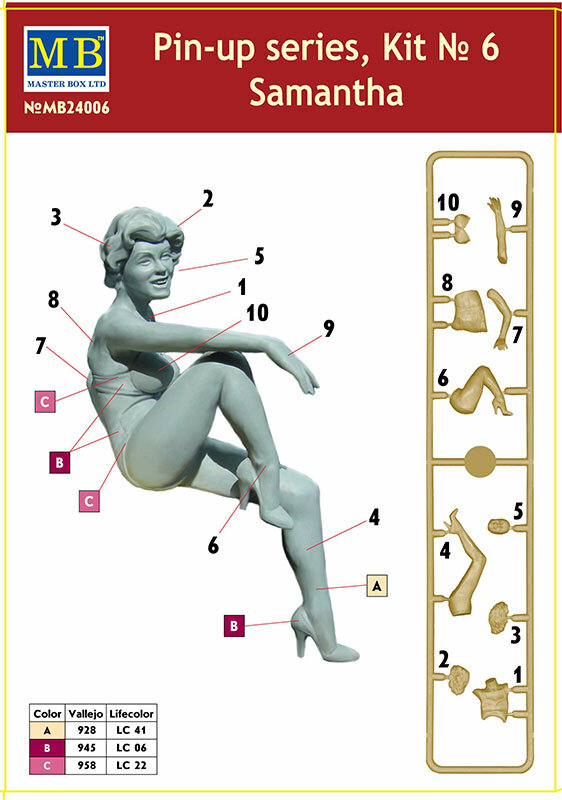 The kit consists of one sprue with parts that allow creating one figure of a woman. The pose of the woman allows using the figure with any number of models. The figure can be posed with almost any part of a car, an aeroplane or anything she can sit on. She can be seated on the back of the bench seat of the cabriolet, can be seated on the splash board of a limousine, a front door can be opened and the figure can be seated inside, etc. “Pin-up series, Kit No. 5. Patty”. This kit is part of new a series in 1/24 scale, the kit consists of 1 sprue with parts that allow creating one figure of a woman. The pose of the woman allows using the figure with any number of models or of creating an independent and very expressive vignette. The figure is performed on a high artistic level and will be a pleasure to assemble. The figure has personal name - Patty. 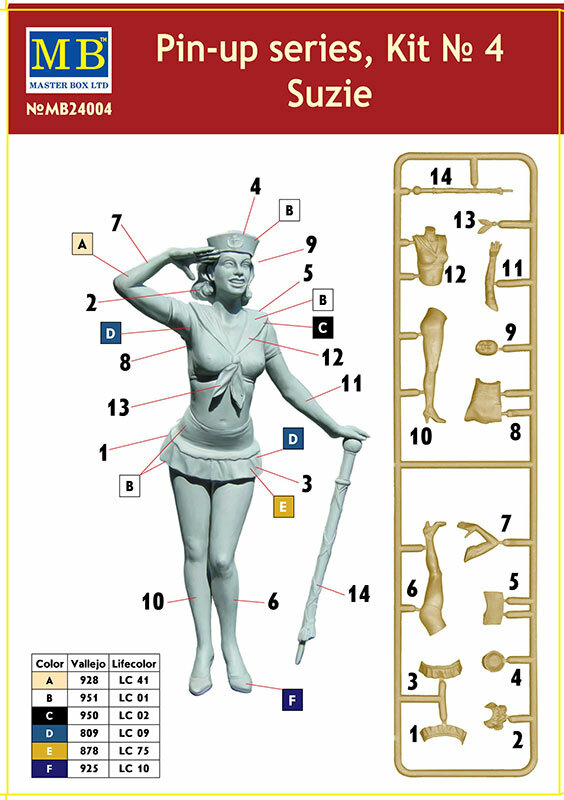 This kit is part of new a series in 1/24 scale, the kit consists of one sprue with parts that allow creating one figure of a woman. The pose of the woman allows using the figure with any number of models or of creating an independent and very expressive vignette. The figure is performed on a high artistic level and will be a pleasure to assemble. The figure has personal name - Suzie.